Measurements: 2.6 x 4.7 inches, or 65 x 120 mm. Back of card: A solid black field. There are seven rows of seven Egyptian eyes, in white outline. This field is inverted & repeated on the bottom half of the card, so these cards may be inverted. Booklet included: No. There is a folded sheet with 7 panes/14 pages. Measurements (folded): 2.65 x 4.7 inches, or 68 x 120 mm. Publisher: Lo Scarabeo. Printed in Italy. Imported by Llewellyn Worldwide. Comments: This is identical to the out of print Tarots of the Sphynx, but reversed, which is strange. There are three other minor changes: The Nefertari deck replaces the Sphynx's blue borders with black, and Nefertari adds a lavish amount of gold foil, which makes the cards quite brilliant when you handle them, and, regrettably, adds to the price. The scanner makes the gold foil look black, making the images above very dark. And the back of the cards are different. Like the Sphynx, there are small white streaks in the images, to indicate age. But with the gold foil the streaks are nearly invisible. The Sphynx deck suffered somewhat from being too busy. The Nefertari, with the gold foil, suffers more so. If the background clutter was eliminated (colored backgrounds, gold foil, white streaks, black/blue borders, etc. ), this would be a strong, clean, powerful deck, perhaps one of the best. Notes in this deck identify Nefertari as the wife of Ramses II, one of the most famous & powerful of all the Egyptian pharaohs. The notes go on to say, "This deck tries to repropose [sic] the atmosphere & the symbology so loved by Nefertari..." Notes included with the identical Tarots of the Sphynx make no mention of the queen or her husband. 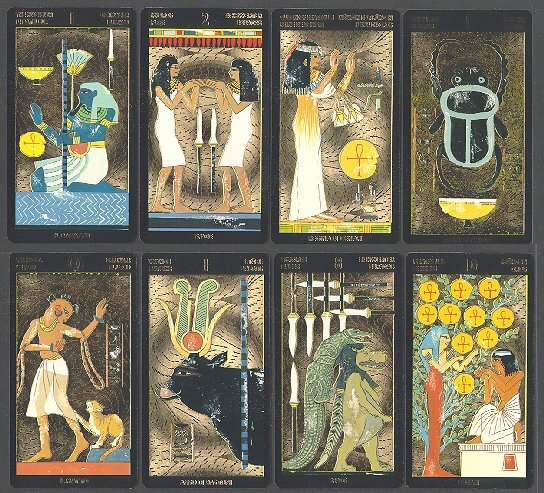 The artist, Sylvana Alasia, has created numerous Egyptian tarot decks. Among them, The Egyptian Tarot Deck and The Cleopatra Tarot, as well as the Etruscan Tarot, which is now out of print.